Take on even the toughest terrain with this realistic 4×4 Crawler. Operate the 4-wheel steering and 4-wheel drive using the supplied LEGO Power Functions infrared remote control. Then ride the roughest rocks with the high-performance extreme suspension. This heavy-duty model also features opening doors and top section. Rebuild it into a tough 4×4 off-road truck. This model has a huge box, much on the line of 42009 Mobile Crane and 8110 Unimog, but unlike the 42009 it isn’t as filled. Anyway it features precious photographs of your 4×4 crawling over rocks and on the backside you have the model B, an 4×4 ugly off-road truck. On the front side you have a flap that reveals the main features of the model, mainly featuring the power function elements and the key elements like suspension and steering. The model comes with three booklets, two of them for the base that is shared between both models and the top part of the car. Although it is a big model, the 4×4 is still a pleasure to build and it can be done in 3-4 hours easily, even less if you avoid lots of steps that are simply done to secure the base until you add the wheels. Here is the complete model. There are several parts worth mention. The wheels of this model are impressive. Big. With a great grip that will help your model climb the biggest steps, or almost climb. I tried changing the wheels for those of the Unimog and the performance was slightly worse. While building I was wondering how this model was supposed to steer because both frontal and rear axis where fixed to the chassis. But after almost completing the base of the model you remove some parts and suddenly the axis are free to move. To steer the model the 4×4 Crawler this set features a servo motor that when used steer to one side or the other but then you release the IR control it returns back to center. If you see the model when you steer to the left, the front wheels move to the left and the back wheels steer to the right making the 4×4 Crawler turns into a very small space. Another great thing of this model is its suspension that makes the model to climb easily over obstacles… and that keep my sons happy while pushing the car down. 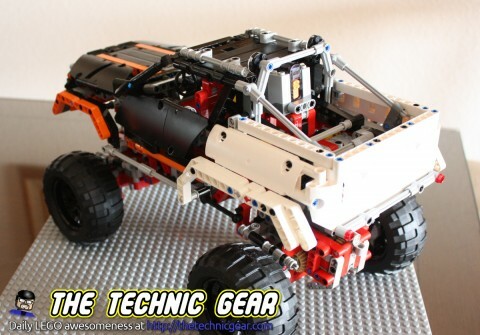 To achieve it 4×4 Crawler uses for big springs on each of the wheels. Some persons says that M-motor is good enough that you just need the proper gears to make it suit you. But if you have been playing a bit with it you will know that most of times it is not strong enough. 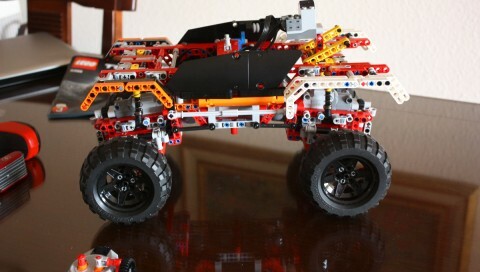 So the 4×4 Crawler features two L-motors that are in charge of moving the front and the rear axis. As long as the two wheels of the axis are on the ground, the crawler will move forward, but if one of them slips the differential will not be disabled and all the power will move to that wheel. Once you build the base the last instruction booklet will be about the car cover. I didn’t use any of the stickers but still it looks quite good. There are several parts of the model worth talking about. The front of the car looks great with all the (fake) lights. The cabin looks quite realistic and the way doors work is quite well done. It is quite hard, if not simply impossible, to have a door opened accidentally while playing with the vehicle. But in my opinion, the most cool part is the one that allows the top part of the car to be lifted to access the battery box. It is quite a clever way to hide the big and ugly battery box but at the same time it is easy enough to access it to replace empty batteries. Also by placing that weight in the center of the vehicle they avoid an ugly problem Unimog had: the vehicle was higher from one side than the other. But if there is anything that place 4×4 Crawler over the rest of similar price LEGO set is the fact that you can really play with it. 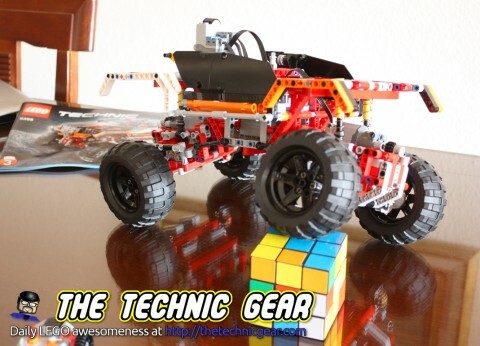 You have an small IR control that commands both L-motors and the servo motor allowing the 4×4 Crawler to move. Don’t expect anything like a real RC Car. This beauty is slow, but it can move over big obstacles as you can see on the next video. 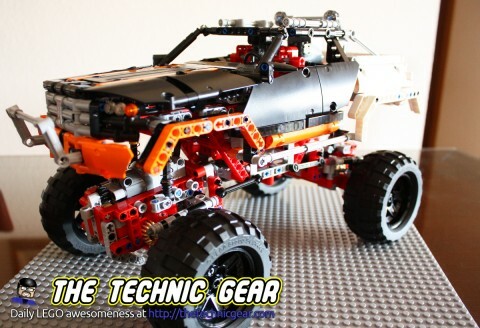 If there is a perfect LEGO Model I think it must be the 4×4 Crawler. I can’t think of anything… maybe price? You can buy it at Amazon for usually around £120.